Save money when shopping on Amazon. Amazon is often our go-to place for buying things online, but the best deals aren't always obvious. There are several ways you can save quite a bit of money when shopping on Amazon, but only if you utilize the right programs and strategies. Here's how. Amazon doesn't conceal their outlet store outright, but most people don't know it exists. Buried within their other shopping categories, their virtual outlet shows you products discounted anywhere from 30-60% off their MSRP (manufacturer suggested retail price). If you don't want a specific item, but rather a good yet cheap TV, blender, SD card, or whatever, the outlet store will show you the biggest markdowns in pretty much any shopping category on the site. Somewhat in conjunction with the outlet store, Amazon Warehouse Deals offers significant discounts on open box and refurbished items. All products get tested at Amazon to ensure they function. Once posted, the online retailer cautiously described the condition of the item. I've ordered quite a few items through Warehouse Deals that claimed to have cosmetic damage and found myself hard-pressed to find a single scratch. While no company dodges errors, Amazon Warehouse Deals boasts a great track record with almost two million reviews. You get to take advantage of Amazon's standard return policy, too, so if you run into a problem you can just send it back. Overall, it's a great way to save a lot of money—especially on rarely-discounted products—without the risk usually associated (or imagined) with used or refurbished gear. You may not always find the price you want when shopping on Amazon, but with prices fluctuating daily you may get it at some point down the line. It's annoying to have to check the site for a better deal on a daily basis, so avoid all that hassle by setting up price alerts with OnlinePriceAlert. All you do is enter the URL of an Amazon item, your email address, and the target price. (You can do this through their bookmarklet, too, to avoid going directly to the site.) When the price drops to your target, you'll get an email. It's as simple as that. Amazon has an affiliates program called Amazon Associates that gives you up to a 15% referral fee on any purchases people make with your affiliate links. While you can try purchasing from yourself to get an extra 15% off, Amazon tends to notice and remove your commission when they do. A better idea is to get an affiliate buddy. Basically, find another friend who shops on Amazon frequently and give them your affiliate code. Whenever they buy something, they use your code. In return, you do the same for them. This way you each get 15% back on whatever the other buys. It may not always be perfectly even, but it's a good way to generate some extra savings without cheating the system. Amazon has a program called Subscribe & Save that allows you to commit to purchasing an item on a regular basis and receive a discount for doing so. The discount is generally between 10% and 15%, saving you quite a bit over the course of a year. You can choose to subscribe to a product every months, every six months, or several options in between. This works for many products on the site such as batteries, shampoo, cleaners, toilet paper, and other stuff you'll need on a regular basis. You can even use it to automate your office lunches. It's delivered to your home when you need it and you don't pay for shipping. You save money and it's really, really convenient. But what if you don't want to actually subscribe to a product? It doesn't really matter. If you buy something via Subscribe & Save and you don't want to continue your subscription, you can just cancel it. Amazon will even remind you a new shipment is coming so you cancel it before they bill you. You make absolutely no commitment to the program by choosing a product, and you can skip any shipments if you don't need it. 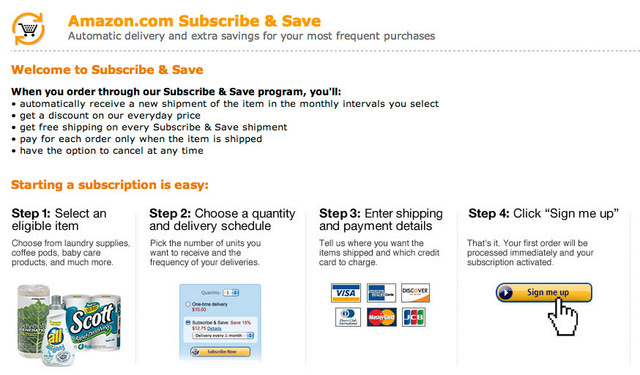 Amazon just gives you the discount on any Subscribe & Save shipment, whether or not you actually use that subscription. So if you want 10-15% off, just buy the first subscription. You can just cancel it afterwards if you don't want more. Amazon offers a one month free trial of their Prime service, which includes free two-day shipping, discounted overnight and Saturday, and a bunch of other benefits. If you don't want to actually pay for the service, you can get a month for free. Just pick that month strategically. For example, pick December or November for fast, free holiday shipping. One important thing to remember is that you can get another free Amazon Prime trial every 13 months. If you always want to get free shipping during the holiday season, just stagger your free trials around that time period so you can utilize the free shipping. Personally, I think Amazon Prime is a service worth paying for, but if you don't shop a lot on Amazon it might not be as worthwhile to you. If that's the case, just use the Prime trial to your advantage and reap its benefits for free when you need them most. We love student discounts—forever. Amazon decided to join in on the fun with a program called Amazon Student. Not only can you can get free Amazon Prime for six months as part of the program, but exclusive deals and promotions. Definitely sign up for the program when you're headed off to college. It's a good way to save money when stocking up on dorm supplies. Although not as much, moms get discounts too. If you need some diapers at 20% off, sign up for the program. Amazon has two particularly useful daily deals: the Free App of the Day (Android) and the Kindle Daily Deal. 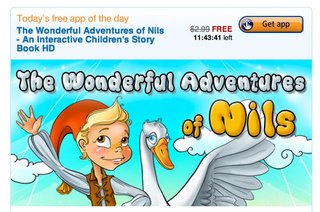 To promote their app store, Amazon chooses one premium app to offer for free every day. The Kindle Daily Deal is similar, providing one heavily discounted book on a daily basis. If you have an Android device, the free app space is definitely worth watching. If you enjoy reading on an electronic device of some kind (as Kindle apps are available for practically everything), you'll also want to check the Kindle deals as well. Photo by Vakhrushev Pavel (Shutterstock).